Spiny Dogfish Devour Pelican! – Ya Like Dags? Killer whales aren’t the only hungry predators off of North Carolina right now. A former student of mine just e-mailed me these pictures from a fishing trip off of Cape Lookout. He was looking for stripers and saw commotion in the water ahead, which usually means baitfish are being chased by something. What he found was a school of menhaden being fed upon by large dogfish, and some of the dogfish were coming up to the surface. Thinking of his dear old TA, he took some pictures on his cell phone camera, and that’s when things got interesting. Dogfish feeding on the surface off of Cape Lookout. Photo by Brody Hooper. Apparently a pelican dove in after some of the menhaden that had been chased to the surface, and then mayhem ensued. Whether the first bite was accidental or not is impossible to tell, but one of the dogfish bit the pelican, and once the blood was in the water it was over for the poor bird. 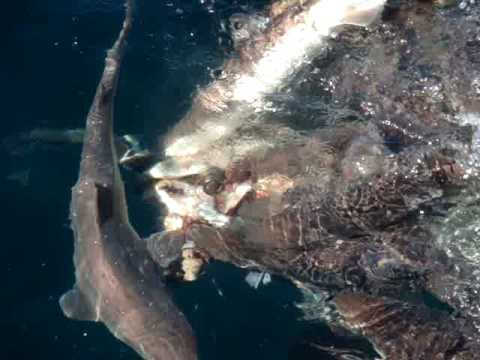 The dogfish piled on the pelican, keeping it from taking off and literally dragging it back under the water where it disappeared in a cloud of blood and hungry sharks. Brody was able to snap a few pictures of this incredible act of predation, which are under the jump due to the fact that they may be disturbing for some readers. Come on, you know what day this is. April fools.